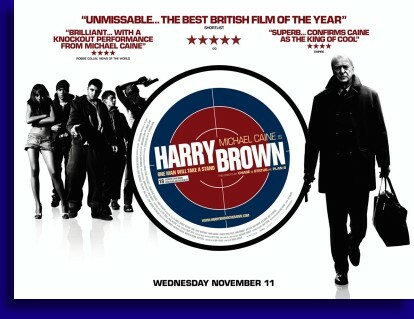 Harry Brown (Michael Caine) is a simple man who has been on this earth for a long time relatively speaking. Like a lot of septuagenarians, Harry is having some difficulties. His life partner will not be with us much longer which has Harry entering a very distraught and lonely stage of his life. Though it is never explicitly mentioned, it appears that Harry and his wife had a child at one time who also expired a while ago. The only thing Harry has is his good buddy Leonard (David Atwell) with whom he enjoys a spirited chess game or a pint or two down at the local pub. But apparently in this realities version of Great Britain the youth have run completely amok and for whatever reason they are terrorizing whomever, whenever they so choose, Leonard included. Leonard, for his part, isn’t going out like a punk and while he has asked the police for help and has also asked Harry for assistance, Leonard has decided to take matters into his own hands and face these ruffians down once and for all. This decision by Leonard will leave Harry with no one to play chess with. away, and justice is looking like it will not be served. Initially I was wondering how a 70+ year old man is going to take out these spry young murderous thugs, especially considering that Harry doesn’t get around as well as he used to. Allow us to tell you that Harry’s hand eye coordination hasn’t taken a single hit over the years as the man is as deadly with the steel as he ever was. Just hope Harry doesn’t have to chase somebody down because that’s not happening. Did I buy into Harry, at seventy something, as a badass? I should point out that I have septuagenarian father whose government also spent an awful lot of time and money training him in the fine art of killing, and I’ll have you know there is no way that I’d mess with this old dude. No way… so yeah… this was not a stretch for me. My old man does seem to be in much better condition that Michael Caine however. Digressions aside, the thug population of London is in some serious trouble because there is an old vigilante on the loose and while he is very polite, he is even more lethal. D.I. Frampton has done the simple math, which points to Harry taking out delinquents, but nobody is listening to her. All Harry needs to do to close the circle is take out this one last punk (Ben Drew), in the middle of a riot, with the forces of nature working completely against him. However I am m still liking Harry’s chances. Directed by Daniel Barber I enjoyed ‘Harry Brown’… but… something is little off kilter about this film. So on one hand you have this social tale on the disaffected cast aside ‘Pensioners’ who are mirrored by the bored and extremely violent young thugs. Harry, in all honesty, is probably more violent than these kids could ever dream of being but Harry’s violence is purposeful with meaning, where these kids, all of them without exception, are just mindlessly violent. There are numerous messages on display, overtly and more subtlety in the presentation of Harry vs. The Punks that had more going on within its narrative than say Charles Bronson and his character of Paul Kersey had in the movie ‘Death Wish’, but not really by much especially when considering how absolute these characters were. But while the social aspects are there front and center, ‘Harry Brown’ is really a crime drama action movie and this is where the movie is most entertaining, mainly because Michael Caine makes it so. Michael Caine portrays Harry as such a gentle mass murderer and the people he’s offing are so reprehensible, I mean he kills way more people in this movie than the thugs do, that it’s really easy to look past the fact that Harry is more psychopathic than they are. Harry even stumbles upon proof that would probably legally send his future victims away for an awful long time but that gun was obviously feeling mighty good in his hands. There are moments when would have to ask how did Harry know who to capture, torture, extort and murder, but then Harry will sadly shed a tear for his lost friend, as if on cue, and then we don’t ask those questions any more. Then there are times, particularly near the conclusion when the movie transforms yet again into something out of ‘Die Hard’ or ‘Lethal Weapon’ with sequences that are totally out of line with what we have seen to this point and are completely unrealistic. This wouldn’t have been so noticeable were the bulk of the movie not rooted so deep in some kind of harsh reality. These previous parts that we had seen were probably unrealistic as well but they weren’t presented as such. While ‘Harry Brown’ isn’t a perfect movie, and the message that murder is the answer to youth violence may be a suspect one… but Michael Caine and the overall presentation of this film still makes it one I found to be very entertaining and very much worth watching.